Dr James McCabe is an Associate Principal Scientist in the Early Product Development Group (EPD) of Astra Zeneca based in Macclesfield in the UK. His research aim is to find the optimal solid form of an active pharmaceutical ingredient (API) for drug development and understand the risks and opportunities associated with that solid form. This includes understanding and mitigating risks associated with hydrate formation as at least 25% of drug molecules can form hydrates. Pharmaceutical compounds can also be exposed to aqueous environments or moisture during certain processing conditions such as wet granulation during tableting. This means the understanding of critical relative humidities for hydrate formation is of paramount importance. To this end, Dr McCabe is always looking for optimum instrumentation to provide the maximum amount of data. Dr McCabe talks about his experience in using humidity controllers and how he settled on the use of the RH95 system from Linkam. 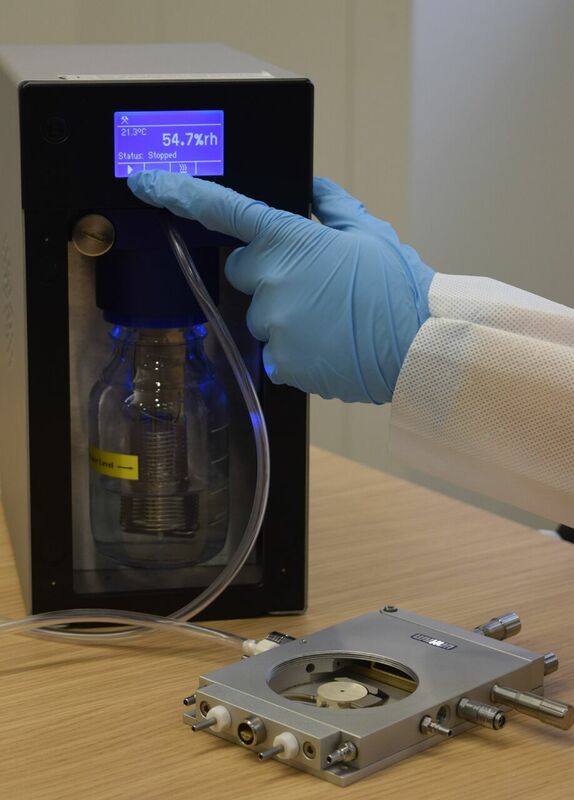 "I have used many humidity systems including dynamic vapour sorption (DVS) from various vendors as well as using them when making environmental X-ray powder diffraction measurements. The advantage of the Linkam RH95 humidity system used in conjunction with one of its temperature stages is that visual changes in crystal/particle morphology (size, shape etc.) can be observed in real time. The stage provides the added ability of then dehydrating samples via elevated temperature as part of the same experiment. This capability is also available on DVS systems, but the images are then macro as opposed to micro. An additional advantage is that in principle a single crystal of material could be assessed using the Linkam humidity system, a sample amount too small for other techniques." Dr McCabe's work with optical temperature stages has included the use of a new technique called­ Thermal Analysis by Structural Characterisation (TASC). TASC provides spatially resolved information on thermal transitions to images/movies acquired by temperature stage microscopy. It highlights any structural changes in the sample providing excellent complementary information with traditional forms of differential and modulated differential scanning calorimetry, DSC & MDSC, both being macro techniques. Dr McCabe is optimistic for future exploitation of TASC in the pharmaceutical industry. "TASC appears to be a powerful thermo-optical technique for measuring optical changes within a sample. Glass transition and melting temperatures can quickly be measured, and complex mixed-phase systems can be assessed. I will carry out further work to apply this technique to other areas such as crystal growth (induction times), dissolution and physical stability of amorphous materials when exposed to the combination of both temperature and humidity change."